In the Gloom card game, you make your eccentric family of misfits suffer the greatest tragedies possible before helping them pass on to the well deserved respite of death. Just mix the 55 transparent cards in this set together with your copy of Gloom to add morbid new Modifiers, Events, and Untimely Deaths. 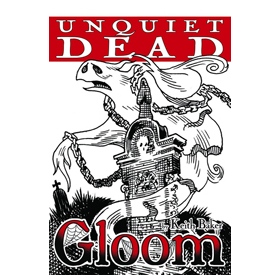 Unquiet Dead also introduces Stories, Undead, and Timing Symbols. The families of Gloom have many skeletons in their closets. 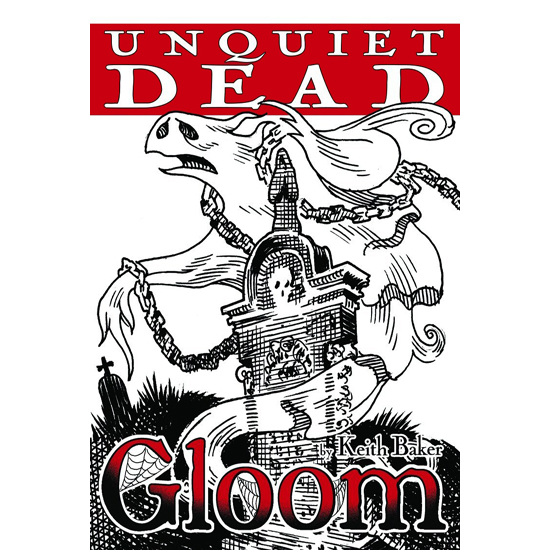 In Unquiet Dead, the spooks come out to play. Mad scientists can Reanimate Relatives or Invent Invisibility. Vampires and shapeshifters can Terrorize the Townsfolk and Go Mad in the Moonlight. These cards give your families even more to fight over. Whoever claims a story gains a special benefit. There are seven special Modifiers that allow a Character to become a supernatural creature, a vampire, mummy, ghost, ghoul, wereduck, invisible person, or haunted portrait. These Undead Characters are both living and dead, you can still play Modifiers and Events on them, but they also count toward your Family Value and toward ending the game. Card effects in Unquiet Dead have symbols to let you know whether a card has an Instant effect that occurs when the card is played from your hand, an Ongoing effect that lasts until it is covered by another card, or a Persistent effect that can last as long as the Character is still alive or Undead.